If you're the owner of a small business, you may be wondering if listing a deal on Groupon can benefit your bottom line. Although it may seem at first like an easy way to drum up new business, Groupon is not really that simple. If you don’t put as much consideration into a Groupon marketing campaign as you would any other lead development strategy and just make a coupon on the fly, you could end up losing a lot of money. Groupon is an advertising platform that is largely geared toward serving local markets. Businesses can use Groupon to promote their own discounts (vouchers) for services and products. Essentially, Groupon is a middleman that wants to connect you with people who will buy your services and products, because the more that people buy from you, the more money Groupon makes. The process is fairly straightforward: You create a deal that is then listed on the Groupon website and possibly featured in its emails to local markets. Customers purchase your deal, and the company collects money on your behalf. Groupon takes a cut off the top; you get the rest. A benefit to using Groupon is that it may expose your business to more ready-to-buy customers. When consumers use search engines to find a product or service, they're usually still in the information-gathering stage and may be a far cry from actually wanting to make a purchase. People who head straight to Groupon have usually already decided that they want to make a purchase and are looking for a deal. Relying on Google to get the word out about your small business is not always successful because you're relying on its always-changing algorithms, and there's no guarantee your site will be shown on page-one search results unless you purchase advertising. In comparison, Groupon shows users everything on its site within a particular set of search parameters. If your business matches what a consumer is searching for on Groupon, then your deal will show. Google's algorithms won't interfere. How Much Money Do Businesses Make With Groupon? According to Statista.com, Groupon’s global revenue was $2.8 billion in 2017. While Groupon uses small businesses to make money, its business model doesn't necessarily benefit them. There's no upfront cost for a business if it wants to list a deal on Groupon. However, Groupon requires that the business discount its services or products offered by at least 50 percent, and sometimes up to 90 percent. Then, when a customer purchases a deal, Groupon takes half of the revenue. This point bears repeating: Groupon takes its 50 percent cut of every single deal sold—not just one—no matter how many you sell. For example, let’s say you normally charge $100 for a private horseback riding lesson. At 50 percent off your normal rate, you’d be offering your lessons for $50 each to Groupon buyers. But you would not make $50; you would only make $25 per lesson sold because Groupon takes half of it right off the top. If you offer riding lessons at 90 percent off on Groupon, you’d only be making $5 on each lesson. 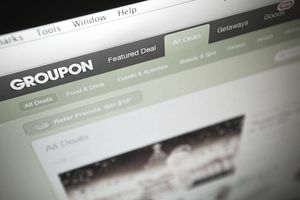 Although Groupon boasts on its website that 91 percent of people who purchase deals will return or say they plan to return to the business later on for additional purchases, those statistics are refuted by other sources, which state that the majority of businesses that use Groupon complain of one-shot customers. With this model, businesses can easily end up losing money. After offering a service or product at a discount and then allowing Groupon to take its cut, a company might not make a profit or even enough to cover the cost of what it's selling—especially if the deal doesn't help increase repeat customers. The good news is that if you find that you're losing money, Groupon doesn't charge any fees to pause or cancel the service. Groupon customers are often savvy deal seekers who purchase and use one-time coupon discounts without intending to keep coming back for more products or services. That’s great if you're looking for one-timers, but not ideal if you need people to sign up for ongoing services. Instead of offering one introductory service at a deep discount, you might try splitting your deal in such a way that requires people to give you more than one try. For example, if you offer guitar lessons, instead of offering a coupon for half off one lesson, offer half off a package of two lessons. That way, people who purchase the coupon will need to try you twice to get their full deal, and that may be enough to convince them to sign up for more. New customers only. Reservation required. Limit one per person, may buy one additional as a gift. However, you should probably not rely solely on Groupon to grow your business. If you are going to use Groupon, make sure you do some careful planning to ensure that you don't end up losing more money than you earn.